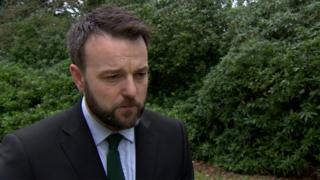 Nationalists "must not be seduced" into believing that an NI Assembly is "a convenience but not a necessity", SDLP leader Colum Eastwood has said. Mr Eastwood was addressing the Fianna Fáil ard fheis for the first time since the parties formed a new partnership. He said there was no hope of reconciliation in Northern Ireland without an assembly. He also said a hard border post Brexit would be a "deliberate violation of our political process" by the government. SDLP and Fianna Fáil: A case of déjà vu? Mr Eastwood said unionists " belong to this place every bit as much as I do". "A key role for our new political partnership is to begin that conversation with unionism," Mr Eastwood said. "Those who have cynically framed the inflammatory narrative that unionism as a whole is unchanging, doesn't believe in rights, and can't be worked with - those people need to be faced down. "That cannot be the basis of our vision - this is not 1968 and we are not second class citizens anymore. "I for one am tired of hearing that argument." Northern Ireland has had no government since January 2017, when a power-sharing deal collapsed. Mr Eastwood said Northern Ireland's difficulties would not be resolved by "setting preconditions for Stormont or even talks". "For any real republican, there is no pathway towards a new Ireland without an assembly in Stormont," he said. "Both the SDLP and Fianna Fáil are coming together to ensure that we return to the vision we imagined and built some 21 years ago." In January, Fianna Fáil and the SDLP announced the partnership arrangement but insisted they were not merging and would retain distinct identities. Earlier this week, Mr Eastwood and Fianna Fáil leader Micheál Martin issued a statement urging all pro-remain parties on the island to form an alliance. Addressing Brexit during his speech on Saturday, Mr Eastwood said that any hardening of the border after Brexit "will be a deliberate violation of our political process by the British government". "No-one should be in any doubt - the instability of Brexit and the instability faced by the institutions of the Good Friday Agreement are inextricably linked," he said. "A hard border in Ireland threatens to bring existential threats to many of our industries - it threatens to position us as a permanent economic backwater." He said the only people who would end up delivering a border backstop "are the hardened Brexiteers, ideologically determined to inflict economic self-harm". Mr Eastwood also criticised Sinn Féin's policy of abstentionism at Westminster. "How can anyone use the pretence of patriotism to avoid their responsibilities to protect the citizens of this country?" he asked. "I say this to Sinn Féin - it's still an empty formula, get in there and do your duty to this country or be forever defined by empty rhetoric." Earlier, Fianna Fáil leader Mr Martin said it was a "no brainer" for him to continue to support the Fine Gael-minority Irish government throughout the Brexit process. Asked if he would put a best-before-date on the confidence and supply deal, he said the government is just two-and-a-half years in office and he would not be "too hasty to put any dates on anything". Can the SDLP and Fianna Fáil avoid the curse of history?